It's so exciting to celebrate holidays with our little loves, but Halloween is one of the ones that is most confusing with a baby. Baby's too young to really dress up, you're too tired to go to a big party, and the ding-dong of eager trick-or-treaters may wake the baby... it's a lot to think about! So what do you do to celebrate? 1. Dress up, even if it's super simple. Long nights, even longer days, being a new mama is tough. When taking a shower or getting dressed feels like an impossible task, the last thing on your mind is finding a costume for yourself—so keep it simple! Pick up a pair of cat ears a few weeks before the big day. You'll appreciate having the option of getting into the spirit—don't forget to draw on some whiskers—on the night of as a kitty cat. If you'd rather hang out at home in your pajamas all day, you can! Skeleton pajamas for the win! I plan on getting some of these comfy and cool PJs for the whole family this year. Obviously, pics of baby's first Halloween costume are fun! But, my personal fall favorites are the photos of the family exploring the pumpkin patch. There's usually tons of fun props like scarecrows, corn mazes, and (of course) pumpkins that your little pumpkin can pose with. It'll probably be a year or two before your kiddo understands the concept of trick-or-treat, but he will definitely enjoy a good storytime rhyme! Spooky Pookie by Sandra Boynton: Boynton’s fun illustrations and silly stories are among of our favorites in this house! Join Pookie on the adventure of finding the best costume for Halloween. The Itsy Bitsy Pumpkin by Somali Fry reinvents the itsy bitsy spider, making it a familiar rhyme for your littles. One, Two... Boo! is a peek-a-boo lift-the-flap story. Five Little Pumpkins is a sing-songy rhyme and fun story about five little pumpkins sitting on a gate. Boo, Bunny! is the perfect introduction to trick-or-treating for toddlers who are both curious and hesitant about Halloween. 4. 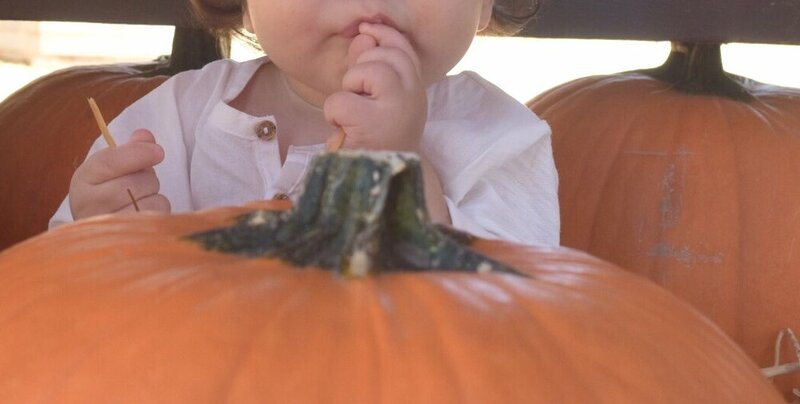 Get messy with a baby-friendly Halloween craft. A quick search on Pinterest will give you hundreds of Halloween craft ideas. The cutest? Dipping your little one's tiny toes into white paint and pressing it to a sheet of black construction paper. Turn it upside down and you have a teeny-tiny little ghost to treasure for years to come. My favorite? Pumpkin carving with the family while playing Halloween jams for our little ones to enjoy. What are your happy Halloween plans? Share in comments!